One of the many things a good architect has to do well is to see the potential in unexpected places. Another thing they need to do well is see the potential in a place where it absolutely is expected… and bring that potential out. It’s that second part that’s the really tricky one. 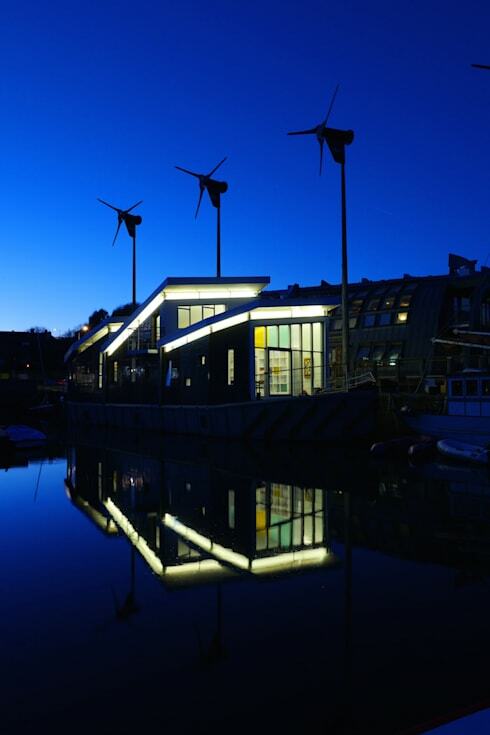 Fortunately for them and for this project, UK architects Marraum are masters of both of those skills. 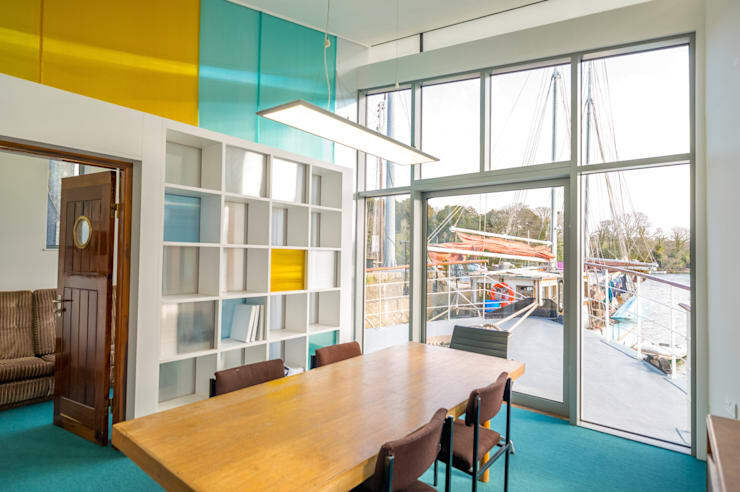 This floating office situated on a WWII Ferro cement barge dating back to 1941 represents an ingenious use of a space that is very special both historically and architecturally. It’s a workplace anyone would envy. 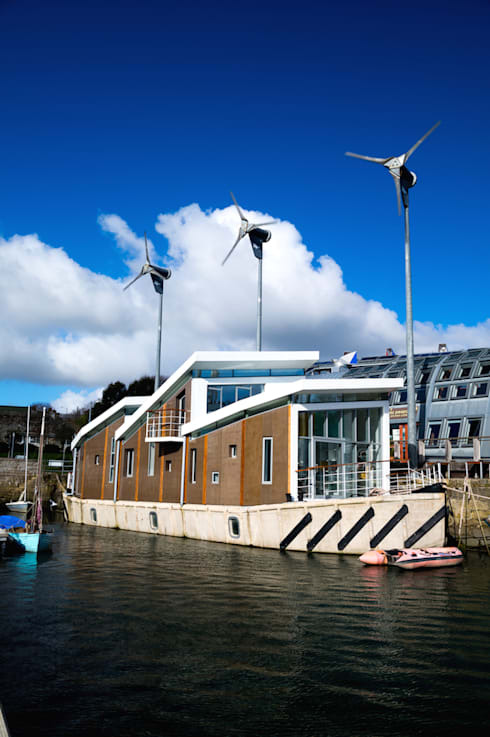 It would be impossible to deny the remarkably striking nature of the basic shell of this barge, even without knowing about all the updates that have been made to it. Like all structures built on or near the water, it benefits from the magic of reflections, which act as a design feature in themselves. 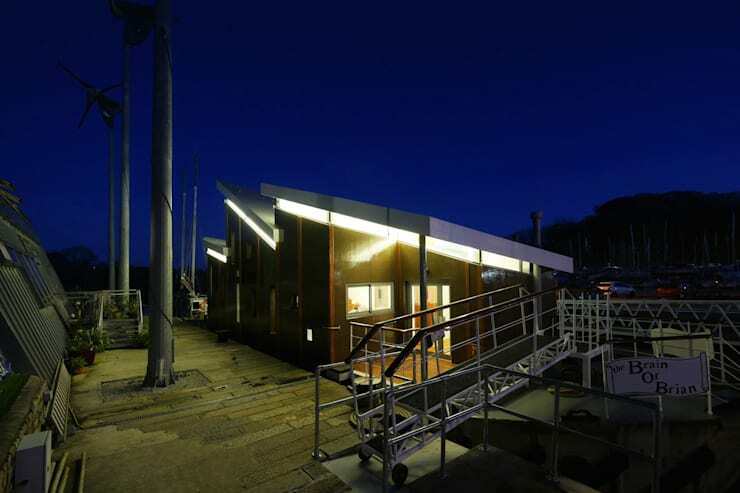 The barge really comes into its own when seen by night, when the lighting innovations implemented by the architects help it shine like a star against the dark sky. This image makes it clear just how powerful the effect of that clever lighting placed just below the overhang of the roof is. Another angle again highlights the magical quality of that fantastic lighting. During the day, the barge seems like an entirely different animal. Here, the barge is firmly anchored in its fascinating historical context due to its extremely distinctive 1940s architecture. It’s the past of this ship that grabs the attention when it is seen fully lit by the sun, rather than the striking modern updates that take over as the focal point once darkness falls. This hallway sets the themes that will continue very clearly throughout the entire interior. Rich, honey-coloured wood will feature heavily, as seen here on that beautiful door, and bright yellow, turquoise and white will liven things up. Copious amounts of glass mean the interior is constantly flooded with daylight. 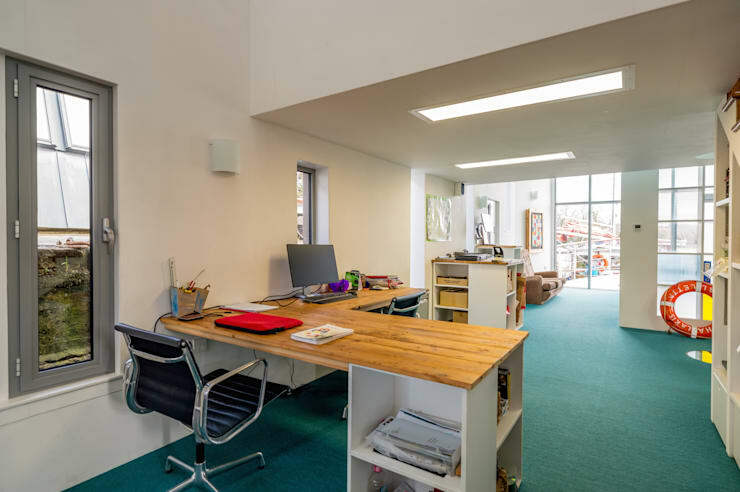 In the main body of the office, old-fashioned wooden elements hint at the nautical nature of this space and the importance of the past in shaping its current look. This gorgeous central staircase demands, and deserves, plenty of attention. Clearly contemporary, classically corporate items such as this standard office chair create a strange and interesting contrast with vintage features such as high quality wooden table tops. 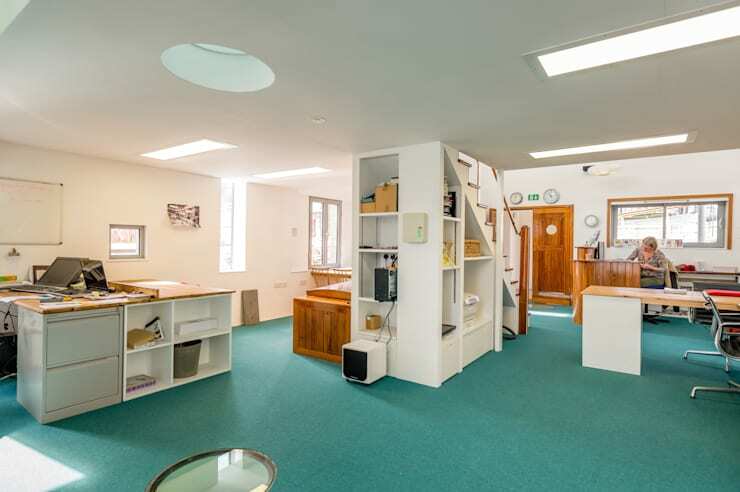 This shot shows how effectively techniques such as under-stair storage maximise the space available and create an open feel in this relatively cramped room. 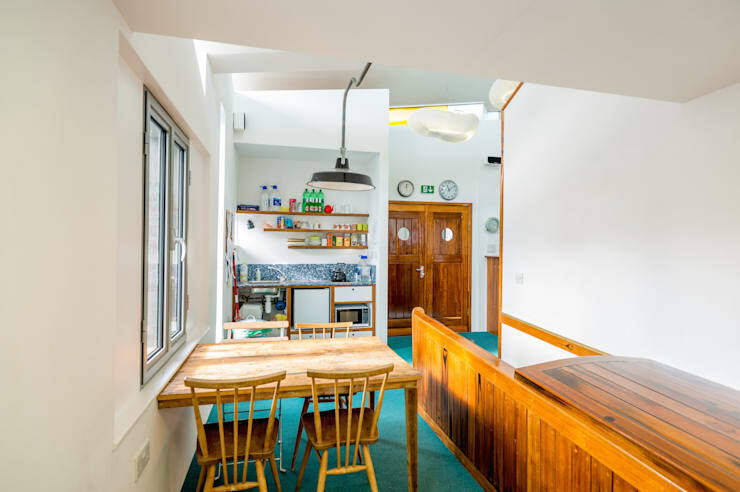 Breaks would always be a pleasant experience in the upstairs vintage style kitchen area, complete with comfortingly old-fashioned dining table and chairs. What do you think about this project? Which parts stand out? Is there anything you would have done differently? Tell us here!